All of our Cobra 7 locks have our unique 7-sided front and matching key, this will increase security and key control over standard tubular locks. 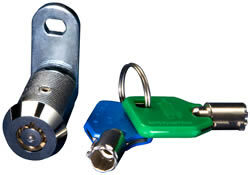 All of our cam locks have our "anti-drill" dimple that will resist drilling attempts. The CobraMatic7 has all the features of our Cobra7, plus the additional benefit of 8-key changes that can be performed by the end user. These 8 changes go in either direction 1-8 or 8-1 or anything in between. This cam lock comes in three sizes. To see how easy it is to change the lock code on the CobraMatic 7----Click HERE to go to our You Tube Channel. Key code change to any one of eight positions. 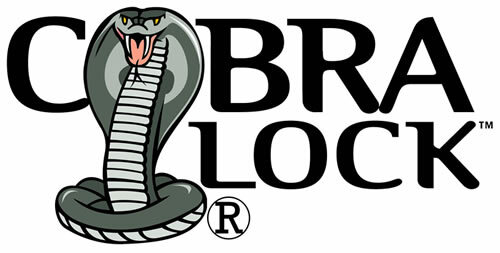 Cobra Standard Cam Locks are designed like the industry tubular locks to insure maximum capability and changeability. 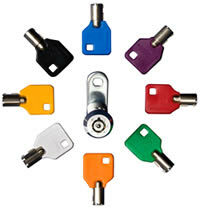 We can key into most other manufacturers tubular cam locks. 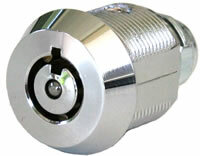 CobraMatic 8-Change Cam Locks are comparable to the standard "GS" series locks. The key code can be changed into one of eight positions. 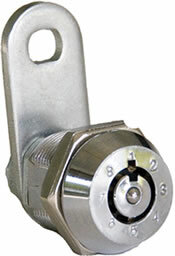 This lock, like all of our cam locks, comes with our "anti-drill" dimple that will resist drilling.